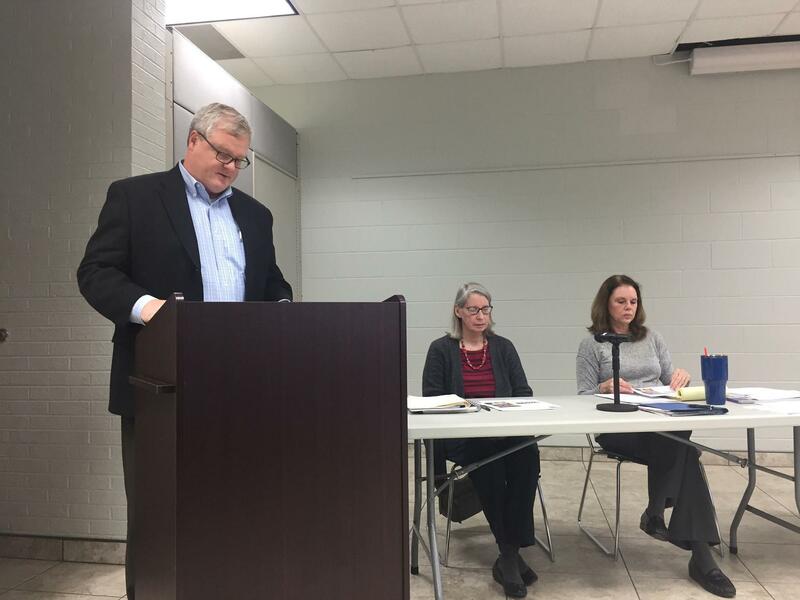 Calloway County Public Library Board members revisited question and concerns about a proposed $6.4 million expansion plan at Tuesday night’s meeting. Louisville-based 5253 Design Group Head Architect Chris Cottongim led a discussion about the Essential Level Plus Plan which has an all encompassing budget of $6.4 million. The proposed plan from Louisville-based 5253 Design Group expands the library to more than 28,000 square feet. It would provide additional meeting spaces and a larger children’s area. Head Architect Chris Cottongim said the expansion plan would also give the library room to grow in the future. “The first night I ever came here I commented on how great a site this is for a library because you’re right in between downtown, the school and the residential area. If you were writing a book about how to develop a library site, this is it,” Cottongim said. 5253 Head Architect Chris Cottongim discusses the Essential Level Plus Plan with the CCPL board. Board Secretary Mark Kennedy asked Cottongim if a bank would be a viable option for a library. Kennedy proposed, instead to move the library into the former Regions Bank building in downtown Murray as a cheaper expansion alternative. Cottongim said he wouldn’t recommend putting a library in an existing structure without the approval of a structural engineer. “The state architect would tell you ‘stay away from all existing, multi-story buildings,’ because they just aren’t designed to carry the load. Maybe this one is, but it would be very strange that it would be,” Cottongim said. Kennedy also expressed concerns with the annual loan payments associated with the proposed plan. Cottongim believes the board can afford the payments without raising taxes. Other concerns from the board members include moving the library to a secondary location while construction takes place. Cottongim said it’s possible to keep the library in its current location during construction to cut down on rent and moving costs, but it would result in shutdown times for the library and would cause a lag in construction. The Board voted Tuesday night to hear results of structural and environmental studies of the former Regions Bank building publicly. 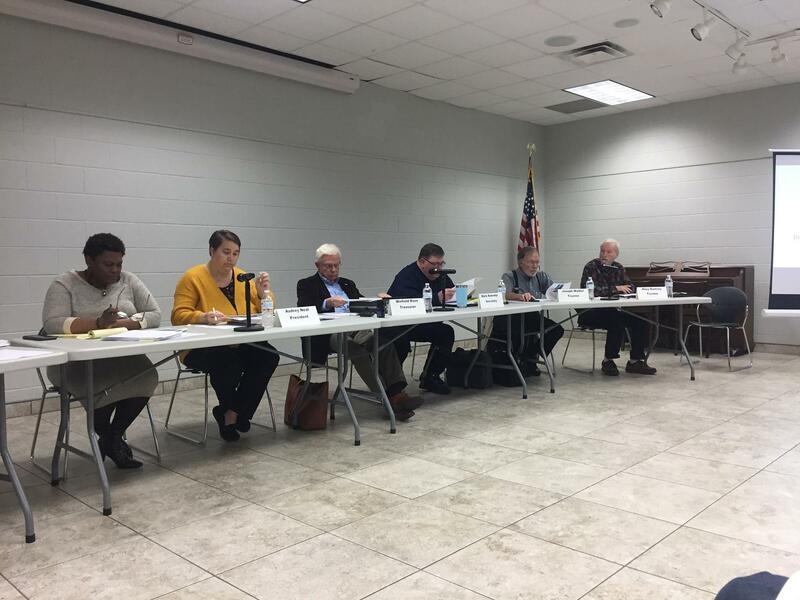 Board members amended a previous motion after building owners Valerie and Mark Frederick requested private meetings with each board member to discuss the findings. Valerie Frederick says she and her husband paid for the studies out of pocket. Board President Audrey Neal said she appreciates the work Valerie and Mark Frederick have done, but she still wants to corroborate their results with a study of their own. “That still does not change the fact that we’ve got to hire somebody and those the prices that we have to look at. I understand and I’m appreciative of your information but we’re not going to make this decision based solely on your information,” Neal said. Board President Audrey Neal has said the Fredericks asked the board to sign a confidentiality agreement regarding the results of the studies. She said the board declined after seeking legal advice. The board previously hired Bacon, Farmer and Workman and AAA to conduct the studies. BFW Executive Vice President Mark Workman said he was told by Valerie Frederick that they hired their own engineer before beginning their study. He said he told them to continue with the engineer they had, because it “wasn’t worth spending the library’s money to have the assessment done twice.” Valerie Frederick said Matrix Engineering conducted a structural assessment of the building and AAA conducted the environmental study. The board also voted to appeal the state Attorney General’s decision that the board violated the state’s open meetings law. See the full story here.